OK, let's deal with the elephant in the room here - yes, a bad thing happened to Charles Xavier in the terrible The Last Stand, but First Class was a reboot, not a continuation. Thus, in the same way that the new Star Trek films follow a different time line, so the new X-Men movies are charging down a different path. It makes bog-all difference to the universe and in no way detracts from just how good Days Of Future Past is. And let's make no bones about this - Days Of Future Past is nothing short of immense. A gripping storyline brilliantly acted with scenes that have you holding your breath. To be honest, isn't that all any of us wanted at the end of the day? Starting in a future where Trax Industries has sold its Sentinels to the American government, mutants and their human allies are being systematically wiped out. The only solution it seems is to hold off the advancing army long enough to send someone back 50 years to persuade the younger Charles Xavier (James McAvoy in sublime form once more) that he needs to gang up with Magneto (Michael Fassbender) to fix the problem. Who has the physical wherewithal to withstand such a trip back in time? ...All the while the Sentinels are closing in on the future X-folks. And it's this race against time that gives the film the main thrust of its tension and drama - the balance between then and now being struck perfectly, especially during the last act. No one puts a foot wrong here, there's not a shot out of place, questions (er, young Xavier seems to be walking...) are answered quite naturally and all the while things go boom and bang in fine style. This is up there with The Winter Soldier in how to make a grown-up, dramatic, serious comic book film. Sure, there are some gags and jokes, but the whole tone of the piece is looking at what happens if you allow the threatening of a minority to go unchecked. That doesn't make DOFP (it's quicker and I'm lazy) a dark film, but it does mean it's tackling a heavy subject - and it covers it well. For lovers of all things hero, there are nods and winks to other parts of the Marvel universe and the original X-Men trilogy - but you don't have to know your Quicksilver from your mercury to enjoy this. 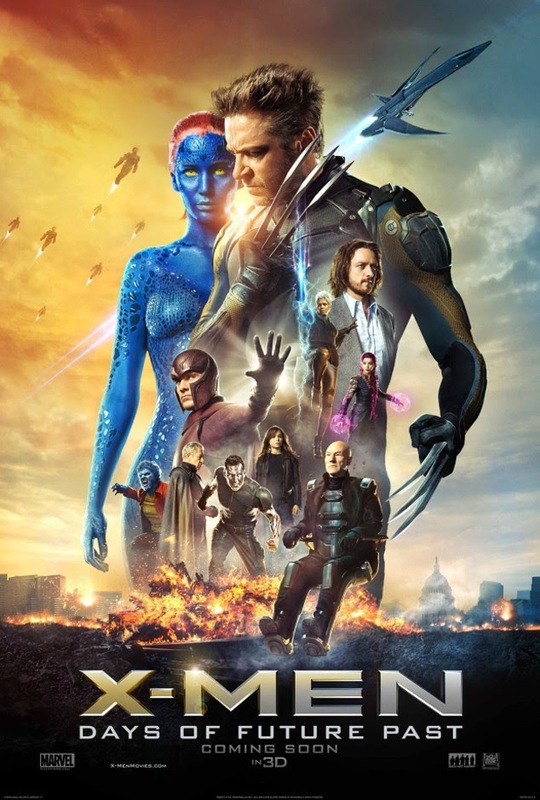 Taken as a stand-alone film, tie-ins to the first are covered, meaning you're not going to be left wondering what the hell's going on, and the film is so well written that you'll be drawn in and caring about the characters before you can say Kitty Pryde. Spider-Man 2, you may recall, was done in 3D - and boy did we know it, with endless trick shots done purely for the benefit of having something to leap out of the screen. DOFP was also shot in 3D, and while I was happy to maintain the tradition of just the two dimensions, it was clear that there were no shots done purely for the sake of trickery. OK, maybe one. But that had a dramatic imperative. OK, two - but that bit with Quicksilver running about to Time In A Bottle was fun, dammit. From start to finish, the whole film feels like it was made this way, without studio execs in the background shoving their money-grabbing oar in. And Magneto moves a stadium (suddenly I fancy a Mountain Dew...). In short, it's got the lot. And if you remember who was in the original trilogy, it's got a whole lot more. From the outset I found myself edging forwards in my seat, and as the film progressed I found myself holding my breath on a number of occasions. Then came the final scenes, and as the clock ticked down I damn near gouged a whole in the arm of my seat. It was a bit good. Even now, I can feel the tension rising as I think back to those closing 15 minutes. It really does have the lot. Oh, by the way, unless you're an uber geek, there's no need to stick around for the bit right at the end of the long, long credits. Yes, it's exciting for the fanboys and fangirls, but the rest of you won't miss out if you wait for X-Men: Apocalypse in a couple of years time. After finally catching the prequel I feel I must see this!